This box is perfect for folks looking for a corrugated fiber, rectangular paralellopiped, storage solution. Great at home, but really excels in the field. 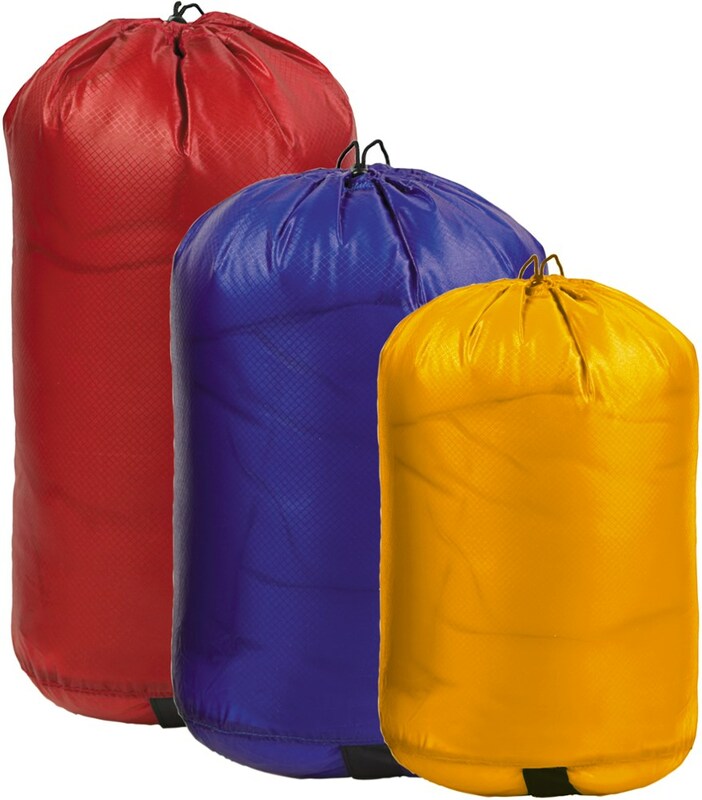 Light and somewhat squishable, yet solid enough to protect vital gear such as stoves and donuts. 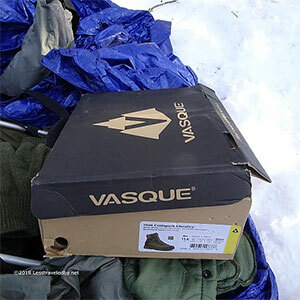 The Vasque Boot Box system is a simple, yet versatile and useful tool. 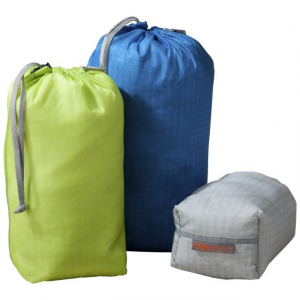 By folding sheets of corrugated paper into a rectangular shape which includes a fold back lid, they have created a rectangular storage space they call a Box. 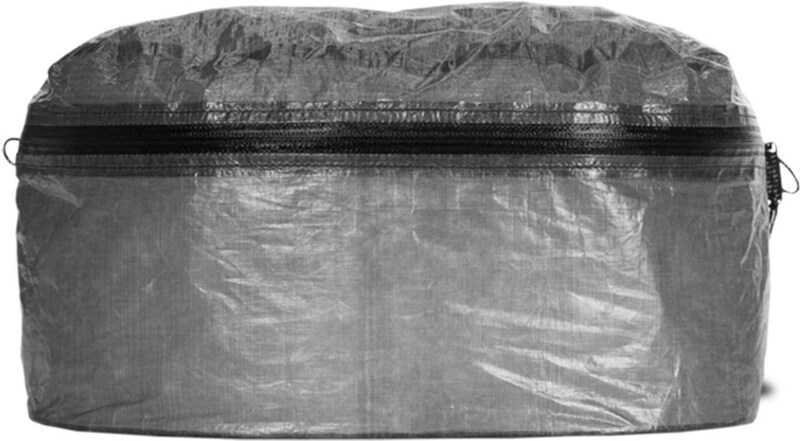 With interior measurements of 14.5" x 11" x 4.75" this parralellopiped has over 750 cubic inches of space for holding stuff, things or what have yous. 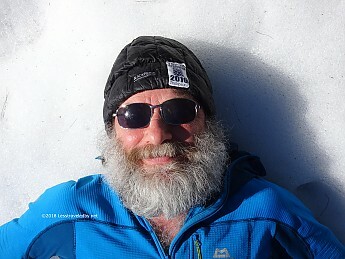 On cold weather trips it is smart to carry everything you might need rather than freeze to death wondering why you didn't. The Vasque Box system contains objects of various sizes and shapes so long as their individual or combined dimensions fit. Being a top loader it is easy to see what you are doing once you pop the solid feeling lid. Inside it is clear from first glance that this space is yours to use as you feel best. No internal dividers or compartments here. Things you need often can be placed on top while things you may not need can settle to the bottom. This actually occurs naturally while on an adventure as you use things and return them to the box they rise. Things that you don't use end up moving farther down. It really is an ingenious system that takes advantage of gravity which is a big energy saver. Two features in the design of the VBBS really make it stand out when you are out standing some place looking at it. As you can see there is a combination quick access and air pressure balancing hole in one of the vertical panels. The primary function is to allow air to escape so a rapid closing of the lid doesn't cause the box to explode, but by making the hole a bit larger than needed and not screening it off it adds a secondary function. It is a nice access point that allows you to shake a beef or cheese stick loose without having to open the box and dig around. Wrenches and fuel bottles can't slip through this well designed hole. The other thing that really impressed me was the use of a Micro-Pak anti mold patch. Vasque didn't need to add this expense to the box, but since they were including a free pair of boots they wanted to make sure the boots didn't create any moldy conditions that would spoil your brand new box before it even got to you. That attention to detail is why this box has become my new favorite corrugated storage solution. 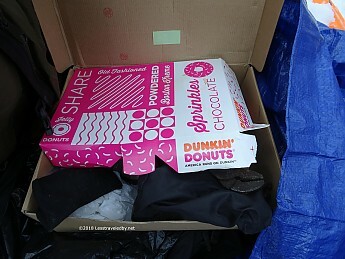 While I wasn't able to track down where the boxes are actually made I did find out that they are definitely manufactured with the environment in mind. 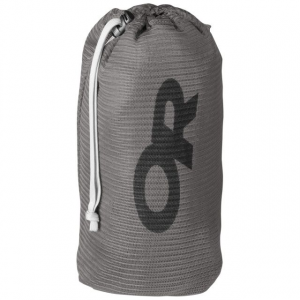 The materials are 100% recycled and recyclable. The ink is also environmentally friendly, though I'm not sure if that is a nodding acquaintance or if we're talking really friendly. It seemed rude to pry. Well made equals well used in my book. Poorly made stuff falls apart before you can really destroy it, but despite being relatively thin, the corrugated panels performed as though they might have been a little thicker. 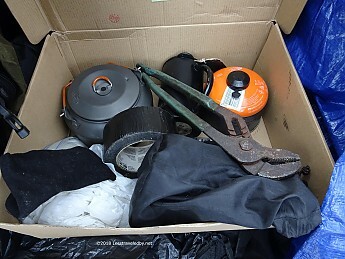 The seams have become flexible over time as being bungee corded to a sled that's being dragged around through the forest, over water crossings and always seems to turn over at just the worst moment...umm...can be hard on a box as we all know. 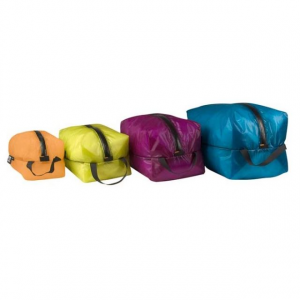 Still it retains its rectangular shape and is recognizable as both a box and container. 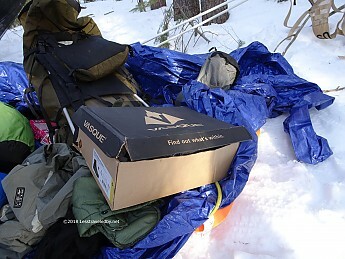 The Boot Box was used only during winter conditions and strapped to a sled. The box isn't intended to be used inside a backpack and my testing showed why. Those pointy corners don't feel very good in any of the packs I tested including both internal and external frames. For those with carts, travois, or pack animals there may be warm weather applications, but I wasn't able to test under those conditions as our llama carted off our travois. This box was definitely rectangular! Once I got those boots out of the way the potential became clear to me as I began to imagine all of the things I could put in there with a reasonable expectation that they'd still be there when I went back for them. At first I thought the sky might be the limit, but then realized that 750 cubic inches would only hold a portion of the sky, so scaled my expectations back. Then I discovered that even after storing a pot, a kettle, two stoves, a fuel canister, an emergency sled nut retightener, a roll of emergency everything else reconnecter, a squeeze tube full of alcohol for priming the Whisperlite, and three sporks (because you can't risk spork failure in cold weather) there was enough room to store a half dozen donuts on top so long as you didn't mind if they got squished a little. As anyone who has had a frozen chocolate donut with their morning coffee on day three of a snow trip can tell you, "mmmfffmff mfffmmfff mmmmfffff (sip) Who cares? Donut!" For those who carry stuff when they go out there or perhaps somewhere else, the Vasque Boot Box System is definitely an option to consider. If you can use the boots, so much the better, but really this box would be worth the price if it arrived empty. Being able to bring my stuff, keep it in the same place as my things, and strap the entire box to my sled really changed how I camp in winter. Instead of pulling things out of a bag or stuffing stuff inside the outside pockets of my pack now I could take them right out of this box. Keep this box in mind if you are looking for a box or other small container and buy knowing it has the Lone Stranger stamp of approval. Happy AFD to you too. A great read and laugh. I have a couple of these boxes and never thought to review them. Now that I think about it I also have some bubble wrap and air pockets from shipments... maybe next year! Ha ha...very nice! 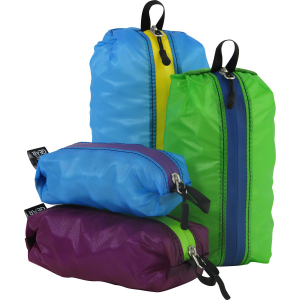 Thanks for telling us all about your "new favorite corrugated storage solution." It sounds like a "very rectangular" gear find! I don’t have any from Vasque but I do have some Salewa, Lowa, and Keen. What I like best is that if you buy a pair of boots the box is free! I did end up with more boots than I needed, but you can never have too many boxes. Great review! And you didn't even mention the off-trail uses. Great review, LoneStranger. I've been looking for something like this. And, of course, like everybody, I love getting free stuff with a purchase. I just think this is a very pricey storage/transport solution, free boots or not. I know what you mean LS. Clothes are not as fun or exciting as other gear, even boot boxes. You put in a lot of time on a review like that one. You posted that about the time I did a couple, but I think earlier RC clothing reviews saturated the interest level. 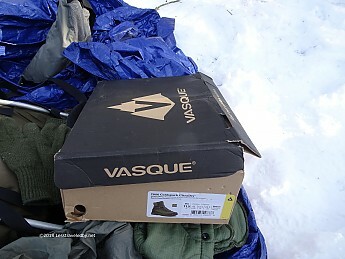 The Vasque Boot Box is not available from the stores we monitor.